At my holiday/birthday party each year the first thing I put on the stove is a warmer full of wine and spices. It's always gone in the first two hours. So, this year I am going to try three new recipes with local wine. Sunset Hills Vineyard, Purcellville -- Serving a blend of Cabernet Franc, cinnamon, cloves, nutmeg, orange, lemon and sugar to warm up your holiday spirit. Mulling spice packets are also available for purchase. Quattro Goomba’s Winery, Aldie - Enjoy mulled wine in the tasting room, or purchase spices on site to make it at home. The Vineyards & Winery at Lost Creek, Leesburg - Grab a glass by the fireplace. Loudoun Valley Vineyards, Waterford - Traditional-style gluhwein available starting in December. North Gate Vineyards, Purcellville - Pair a glass with truffles from Maryland chocolate from Perfect Truffles. Corcoran Vineyards, Waterford– Mulled wine available every Saturday. Hunter’s Run Wine Barn, Hamilton – Mulled wine made with Chambourcin or Merlot. 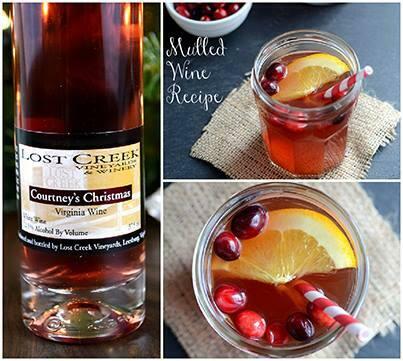 Hidden Brook Winery, Leesburg – Mulled wine make with apple cider and wine available on site, and mulling spice -- made in Gaithersburg, Md., -- are available to bring home. Hiddencroft Vineyards, Lovettsville- "Grandma's Love Potion" (blueberry wine with 2% residual sugar and 12% alcohol) is mulled and spiced with cinnamon, cloves, allspice and lemon or orange peel. Northern VA Magazine has details from last winter's brew.